Where: In Sandpoint, 524 Church St., and Coeur d’Alene, 504 E. Sherman Ave. (with entry on Fifth Street). Randy Evans reaches his hand into the roaster and picks an errant bean from the slowly turning pile that is being spread around the cooling bin. His other hand rests in his pocket. In a constant low hum, the stainless steel arm turns in even, mechanical rotations. The beans roll and tumble against each other, their history perfuming the air as if horticulture were poetry. With each sweep of the arm, beans are ejected like slot machine winnings from the front of the roaster. They pour into a deep bucket with a woody, musical sound, filling it rhythmically until the roaster is empty. Over the whir of the machine, the normal hubbub of business can be heard. Someone is on the phone at the back of the room, leaning into a computer screen. A body reaches past to grab the full bucket and cart the beans away for packing. If coffee could speak, it would tell you a story of its rather exotic life. By the time a cup of the drink makes it to your mouth, it’s been carefully grown, harvested, dried, processed, transported, roasted and brewed. And each chapter of that story was directed by a different expert, passionate about what they do, not just because they like coffee, but because coffee is likely their livelihood. What we think of as the bean is the seed of the cherry. The coffee cherry is grown best at higher elevations. The higher the elevation, the longer the cherries need to ripen. This allows time for a more complex and dynamic flavor to develop. These are qualities that cannot be rushed. And cultivating it is an art passed down through generations. Its refinement becomes the culture and income of a family, of a farm and of a people. Rick and Randy Evans know firsthand of the sort of personal work that goes into such a living because their own grassroots coffee company is founded on the same principles of sustainability and community. And a love of coffee. Ten years ago, the brothers were riding Schweitzer’s Chair Six and contemplating their unknown futures. Both had come to Idaho to raise their families and live the dream. Randy had a background in coffee roasting. Rick was selling real estate. But the dream was still missing. As the lift made its journey up the mountain, the Evans brothers had the kind of conversation that shapes families. Rick asked Randy what he really wanted to do. Randy wanted to share his appreciation of good coffee and the culture around it. Rick wanted to support family, a love of the outdoors. 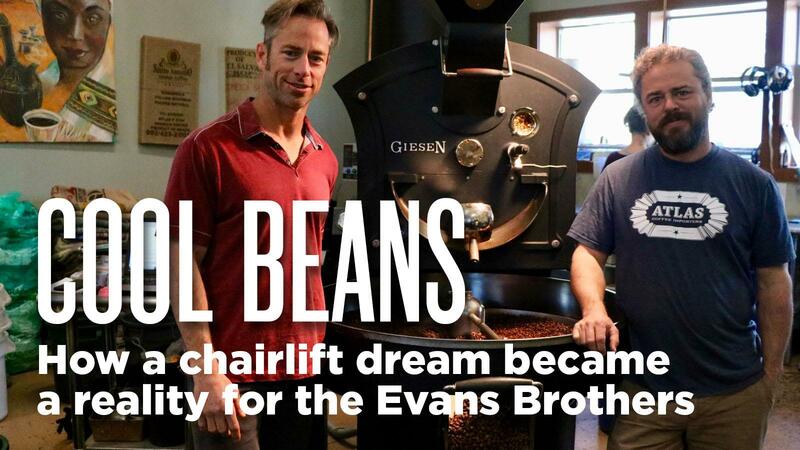 By the time they reached the top, they had found a way to do it all and Evans Brothers Coffee Roasters was born. Six months later, the brothers released their first roast: Chair Six. Two years later, they opened their coffee house in Sandpoint. In 2017, they opened a location in downtown Coeur d’Alene. The walls of their Sandpoint office are covered in photographs of their families and pets. A few of their prizes are tacked to the busy walls. There are scribbled notes, a white board with reminders about employee development, some floor plans, filters. They talk about the trade of coffee in a world where small farmers are often commercially driven under the umbrella of larger organizations. Sometimes they have to follow practices that are unknown to them. Sometimes they are just unaffordable. It is that story the brothers sought out. They look for it in Ethiopia, Costa Rica, Guatemala, Columbia, Brazil, in the mountains of El Salvador where the Menendez Family grows cherries at 1,700 meters. They know this because the Evanses go there to rake soil, learn the details of their farming practices and break bread with their family. These small farmers share their craft and their homes. They share their challenges and their solutions to sustainable farming in an ever-changing climate. “We pay about four times the fair trade price for our beans,” says Randy. In this way, they can support the sustainable growing practices and ensure that producers can continue to provide the finest coffees of the world. The best producers employ farming techniques that extend far beyond their small or medium farms. It’s not about how much yield they get in a crop, but how the carefully cultivated soil has nourished the plant. After all, that farm has been and will be used for generations. They install bee hives to improve pollination. They prune the trees in April and May so as not to disturb the bird migrations. They use leaves and ash and chicken manure to keep the soil rich. They don’t blanket fumigate or use red flag pesticides. Instead, they treat diseases specifically to eradicate the problem before it spreads. And this can only be done if the crops are being carefully tended to each day. Not by machines, but by hands. The results are evident. The farms flourish. The families eat well. The coffee beans make their way to North Idaho where the final roasting process takes place and a cup of coffee is eventually poured. Pretty good coffee, most likely. Because Evans Bros Coffee Roasters have won a host of prestigious awards across America, from Good Food Awards to placing in America’s Best Coffee House. And if you aren’t sure what the difference is, the adept baristas at one of the locations can explain the coffee growing, roasting, and brewing process at length. Do you prefer a little citrus, honey or a hint of chocolate? You won’t sound pretentious when you ask. The barista genuinely wants you to enjoy your cup of coffee. Their coffee houses are not a place to get a caffeine fix (though they serve this as well), but rather a place to take pause, sink into the moment as one sips an artisan cup of something wonderful, and passively soak up the pleasant atmosphere. Sitting at the coffee shop, there are dramatic paintings on the wall. They belong to a local artist who will decorate the shop as a gallery for some time. The vibrant colors bring energy to the room. On Saturday morning the local jazz band might come and strum while families with children wander in. In the far corner, three older gentlemen are leaning over the same newspaper, chatting and waving their hands at each other. A woman is knitting on the couch. There is a business meeting happening at a table. A dog sleeps at someone’s feet while they sketch on a pad. The easy, welcoming atmosphere is not just in the sounds of conversing coffee drinkers, but in the cheerful expertise of the staff. The company wants their employees to live their own dreams, too, whether they desire to learn more about the trade or are merely looking for a good employer while pursuing other paths. “We work to provide an environment where our staff can grow and learn, where people can thrive, whatever their passion is,” says Rick. His happens to be winning Spartan races here and there when he’s not at the roastery. Randy is petting the puppy, sound asleep in his lap. “We aren’t workaholics,” he says “in the beginning, we were a little.” Rick nods in agreement. They aim to set an example of balance in life while running a successful business that cares about everyone in the process. “And we want coffee to be approachable,” says Rick. The culture of coffee can have a hint of snobbery to it, much like wandering the vineyards of Northern California. The brothers want you to savor your cup and explore the flavors with curiosity. Beyond developing an addiction to good coffee in the general population, the brothers contribute to the communities in which they operate. They spotlight a different local non-profit each month to aid in fundraising activities, providing thousands of dollars to these organizations each year. The brothers have used the term “progressive ideals” several times in our hour together. It takes me most of our conversation to realize that what they mean is not a political landscape or new roasting technology. What they are talking about is the progression of values that support what they believe in most: each other, the people they serve, their community, and in the preservation of a trade that relies on sustainable practices for a healthy planet. And of course, really, really great coffee. Published: April 2, 2019, 5 p.m.